The new Evernote Smart Notebook by Moleskine uses Evernote's Page Camera feature to capture the pages of your notebook with your smartphone or tablet. Evernote Page Camera is available for the current iOS and Android release. Evernote Smart Notebook features unique "Evernote ruled" and "Evernote squared" page styles with dotted lines designed to ensure a clean image when digitally capturing your notebook. Moleskine Smart Stickers introduce Smart Tagging into your workflow. When you capture a page with Evernote, the Smart Sticker icons become searchable, digital tags that make it easy to keep your ideas organized and to keep your digital and analog workspaces synced. Each Evernote Smart Notebook comes with 3 months of Evernote Premium, which offers a number of added features to make your newly-digitized, handwritten content more accessible, searchable, and shareable. 1. 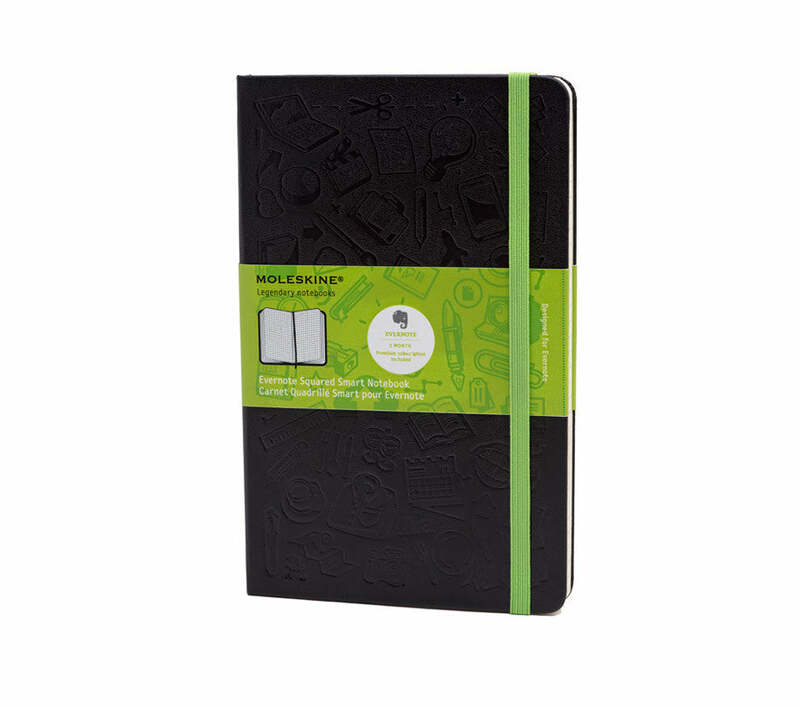 Write, sketch, or draw in the specially designed Evernote Smart Notebook by Moleskine. 2. Take a photo of any page in this book with the Evernote Page Camera and it instantly becomes digital so that you can save it, search it and share it with the world. 3. Once in Evernote, you can search for your handwritten notes by keyword, tag, or just visually browse. Size (inches): 5" x 8,25"